Bernard Poulin is a commission painter and sculptor. 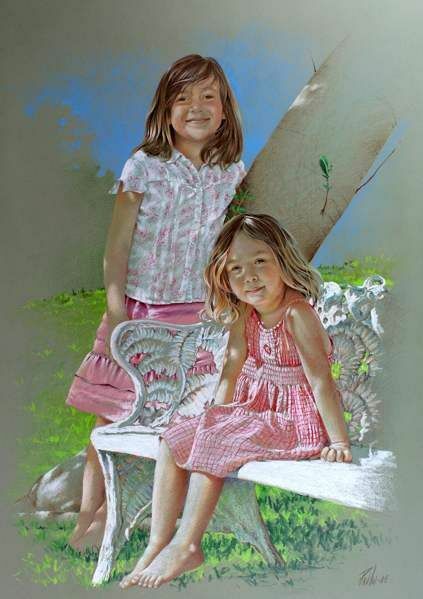 He creates both official and private portraits for an international clientele. His solo exhibitions are rare and are usually sold out before they are even created. He is the author of 9 books (5 on drawing). Beyond Discouragement - Creativity was published in 2010. It is a review of our times and their effect on creativity in both adults and children. In 2012, his short story Please Daddy Hold My Hand was illustrated by Dominic Bercier. The Senate of Canada commissioned this official portrait of the Speaker of the Senate Rt Hon. Roméo Leblanc. The image shows him in his office on Parliament Hill. Though he loved his work in Ottawa he missed his home town in New Brunswick. I acknowledged his feelings by showing a scene from that area through the Parliament building windows. Following his position in the Senate the Rt Hon. Leblanc became the Governor General of Canada. Dame Jennifer Smith was Premier of Bermuda between 1998 and 2003. Her official portrait was commissioned by the Government of Bermuda. In it, we can see various relevant symbols. The hibiscus bush is reminiscent of Bermuda’s landscape which includes in the background the Parliament buildings. The Premier wears a PLP (Progressive Labour Party) pin. Her hands embrace a book - symbol of her great interest in learning. She is presently the Education Minister. This painting was created "Alla prima" - all in one sitting. Inish, a Bermudian living in Clonakilty Ireland actually plays the flute - and that, very well. I could not overlook the dreamy staring off into the distance which fits the mood of this outdoor serenade. I rarely pose children for a portrait. And this means I never know what I will get as a result of their choices. With Macy and Abigail, the time spent in the garden went from rambunctious play to a contented and cooperative calm. When I look at their faces, I smile, knowing that it is always best to simply allow children to be who they are - wondrous personalities. I have been in love with sailing vessels since my first drawing of a boat in Crayolas at the age of 4. From the day of its launch in 2006, the grace and lines of the Spirit of Bermuda have moved me. A 112 foot replica of the fast 19th century Bermuda sloops she acts as a youth training vessel. 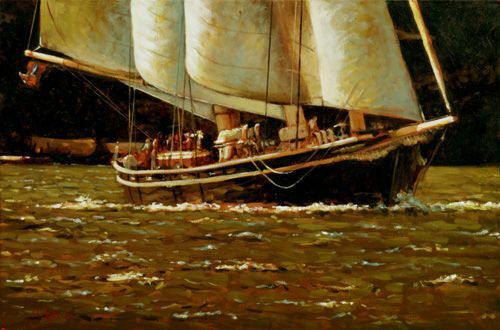 In this painting she is heading home after a voyage. In 2008 I created a limited edition giclée print entitled The Rebirth of Venus. I did this in recognition of the 50th anniversary (2009) of the most prominent symbol of our era’s cult of the ugly. It shows Barbie symbolically rising above the waters as Botticelli’s beautiful Venus sinks.